Growing Ammi Visnaga and Ammi Majus From Seed. In the roaring twenties my delightful Great Aunty, Kitty Higgledy, grew heaps of Ammi in the cut flower gardens at her house, Foodletronk Hall. Summers at Foodletronk Hall were one long party and wild-eyed flappers would Foxtrot around the flower beds with bewildered young men whilst Kitty made everyone headbands made from her flowers….she always used Ammi at her parties….she would say Ammi was ‘so jazz….it’s the bee’s knees’…which made everyone laugh out loud because back then, saying that, was funnier than it is now. Both Ammi Majus and Ammi Visnaga make superb white foliage fillers…Visnaga has more defined domes of white clustered flowers…I like both and usually grow them together or in neighbouring rows. How To Grow Ammi Majus And Ammi Visnaga In Your Cutting Garden. Ammi Visnaga. Image credit ‘Greencubelandscapes’. *Great Aunty Kitty would sow in August or early September and/or April, May and June. *Personally I direct sow into the soil as I find Ammi can have a sulk if her roots get disturbed by moving her from a pot in the greenhouse to your cut flower patch. 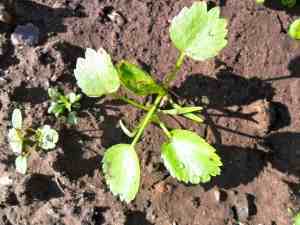 Some other growers will suggest you can sow in February undercover….I think February and indeed March is too early, you plants will get leggy and weak (if they germinate at all)….and I don’t sow until the ground has warmer up in mid April….I find you can sow all the way into June should you wish. 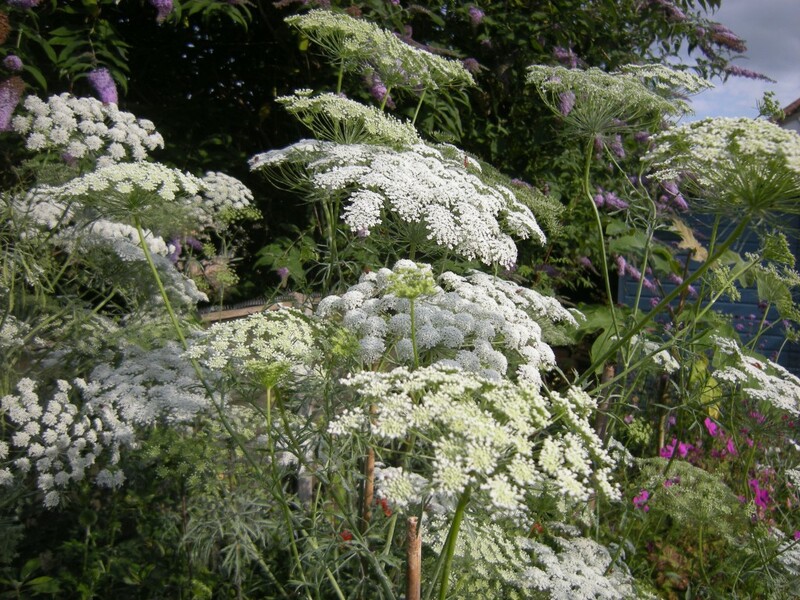 *A Spring sowing will be in flower in late June – August…in 2014 I still had Ammi Visnaga in flower in November. *I sow in straight drills and only lightly cover the seeds…about a millimetre is enough and ensure your soil has been raked to a fine tilth…remember these seeds are tiny…and don’t want to struggle through six feet of heavy soil to reach the light. *Ammi likes lots of water when she gets going so try not to let the ground dry out completely. *The bed should receive full sun and be well drained….if your soil is clay (shudder)…you can make raised beds and add heaps of compost and grit. 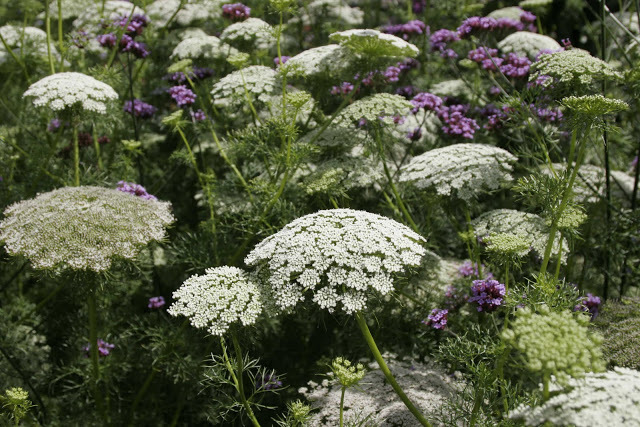 *It is well worth staking Ammi unless your cut flower garden is super protected from the wind. NB A note on Autumn sowing…in previous years I have advocated sowing Ammi in August and throughout September….whilst a late September sowing may be fine down here in sunny Cornwall I am discovering that many customers are finding the soil temperature has dropped too much. So from now on I shall be recommending that folk north of Oxford sow before the end of August and those south of Oxford, before the end of the first week in September….those in Cornwall can just do what they like when they like….YEAH BABY! Ammi Majus is an extremely versatile flower to have in you cut flower ‘portfolio’ and it can be used alongside a whole host of other annuals and perennials. I, of course, sell Ammi Majus and Ammi Visnaga in the Higgledy Seed Shop. Salvia & Eschscholzia. Aster ‘Ostrich Plume’ For The Cut Flower Patch.